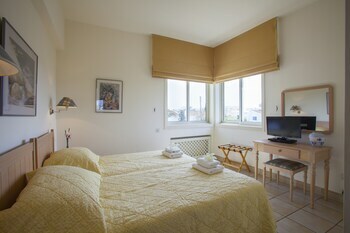 When you stay at this apartment in Protaras, you'll be near the beach and 8 minutes by car from Profitis Elias Church. Located in Protaras, Thalassa is convenient to Fig Tree Bay and Konnos Bay Beach. The front desk is staffed during limited hours. Free self parking is available onsite. With a stay at this apartment in Protaras, you'll be on the beach, within a 15-minute drive of Ayia Napa Monastery and Fig Tree Bay. Free self parking is available onsite. With a stay at this apartment in Protaras, you'll be near the beach, within a 15-minute drive of Ayia Napa Monastery and Fig Tree Bay. Free self parking is available onsite. Located in Paralimni, this villa is a 5-minute drive from Protaras Ocean Aquarium and 5 minutes from Trinity Beach. Free self parking is available onsite. When you stay at this villa in Neo Chorio, you'll be within a 10-minute drive of Latchi Beach and Latchi Harbour. Free self parking is available onsite.